Happy Halloween! 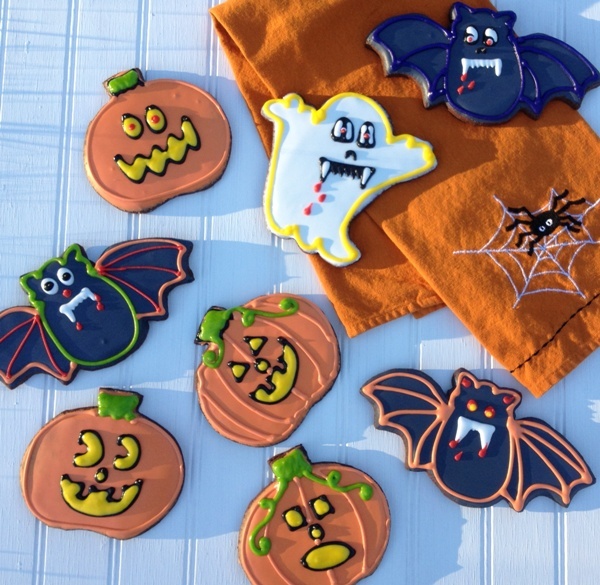 I’ve been keeping it tasty at our house with some Halloween themed cookies, among other things. These cookies are super dark, like midnight. Thus. my name for them. This is just a variation on a chocolate spice roll out cookie I make but it’s so tasty with the addition of espresso powder I figured I should share. 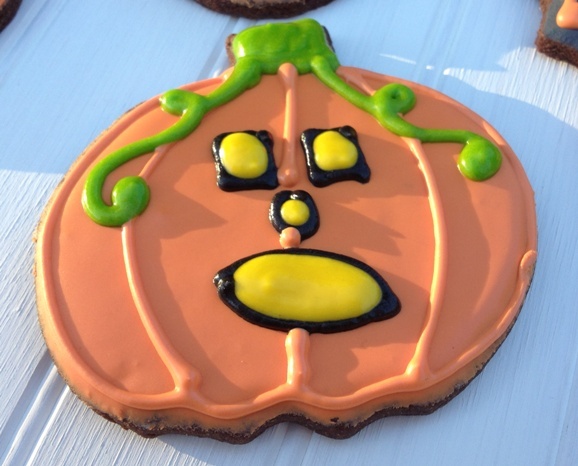 You certainly don’t have to be as elaborate with your cookie decorating. You know how I get. You could slather on some sort of icing though because these are not that sweet on their own. (I still love them without icing because they are sort of chewy and only moderately sweet, but Tim prefers them with the added sugar boost. Your call. )I love a good cup of coffee/espresso. Lucky for me chocolate desserts really benefit from some added coffee. Brings out the chocolatey-ness. (Is that a word? Spell check says no.) I’m planning on making decorated sugar cookies for Christmas, too. What flavor? Plain sugar is good but. . . .well, plain. I’ve made coconut, lemon, chocolate, etc. Chocolate mint perhaps? Or maybe vanilla mint? I’m mulling it over. Christmas is creeping up on us. AHHHHHHHH!! Talk about scary. These are simple to make so I’m not going to bore you with many details. If you want more detail take a look at these previous chocolate spice cookies I made. I use this icing as my default cookie icing, by the way. Other things going on for Halloween around here? 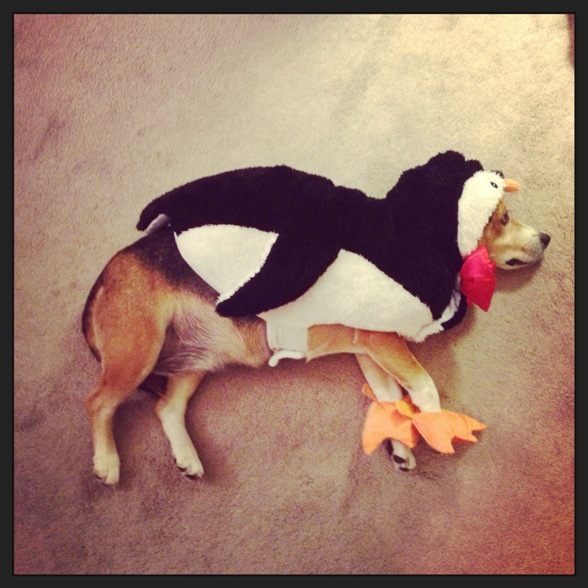 Well, there’s a penguin making occasional appearances. Against her will, of course. 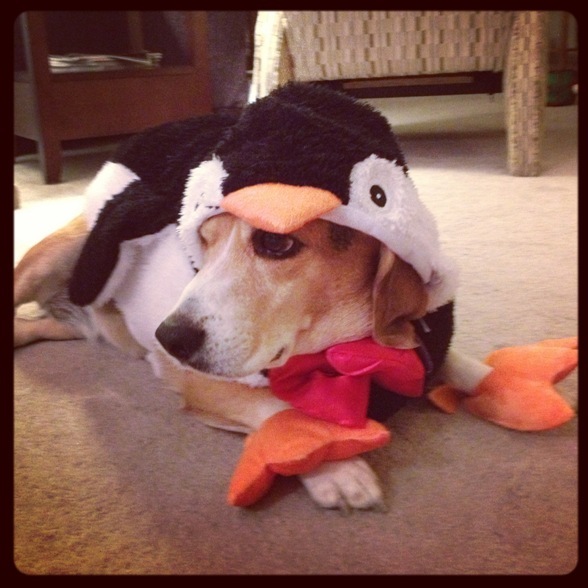 This is what happens when you dress a beagle as a penguin. . . they fall right over. Heavy costume? Or willful defiance? The latter. 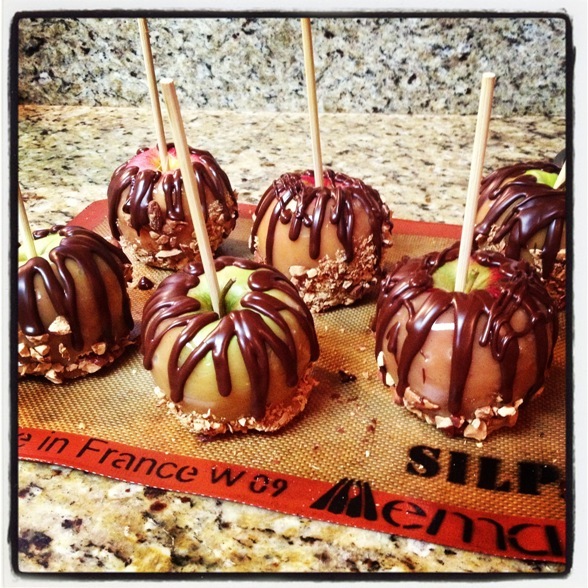 A caramel apple craving turned into me making half a dozen from scratch. (I mean, I didn’t grow the apples.) I was once again reminded that homemade caramel is a pain. The first batch wasn’t set up enough, despite me accidentally getting it too hot. I scratched that caramel and made batch two which worked and is delicious but is a bit too chewy now. Still totally edible and they sure look pretty. I had one for breakfast this morning. What else can I do when they sit taunting me on the counter. Apple, almonds, milk in the caramel & chocolate. I might as well have been eating oatmeal. Right? Enjoy your Halloween! I recommend some hot spiced cider, a few cookies and curling up with a good Halloween movie. My pick is The Nightmare Before Christmas. In a large mixing bowl beat together the butter and sugar until light and creamy. Add eggs and instant espresso. Mix well. Add the cocoa, baking powder and flour. Mix until a thick dough forms. Wrap the dough in plastic wrap and allow to rest in the fridge for 20 minutes. On a lightly floured surface roll half of the cookie dough at a time until it is about 1/4″ thick and cut into the shapes you desire. Place cookies on a parchment lined baking tray and bake at 350 degrees for 10-15 minutes depending on how large your cookie cutters are. 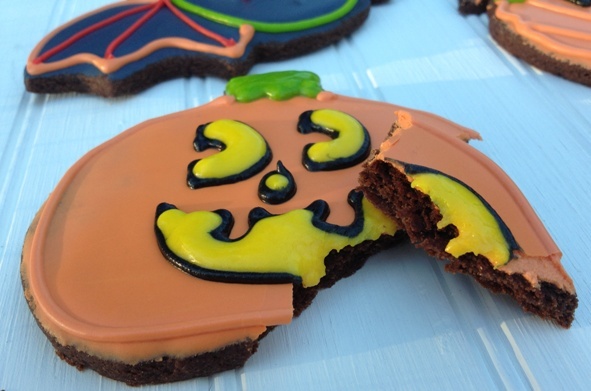 Allow cookies to cool completely before decorating. I use this icing to decorate my cookies.